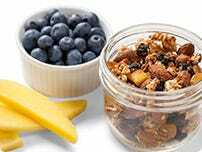 Are you looking for the best trail mix to compliment your healthy weight loss plan or gluten-free diet? Your search has ended. Our selection of high protein trail mixes contains no GMOs, no preservatives and no cholesterol, making them the right choice whenever a crunch craving strikes.